I feel a bit conflicted as I write this opening paragraph. Not because of anything to do with Pittsburgh's Slaves BC, but because it finally looks as though the end has come for Terrorizer Magazine, according to Toilet Ov Hell. I feel conflicted because I read a lot of Terrorizer when I was younger and always enjoyed yet it seems that communication about their demise was lacking, in spite of still having loyal subscribers. I don't know the ins and outs of the situation, but the magazine will be missed even though the Internet now carries the long-form torch (sort of). 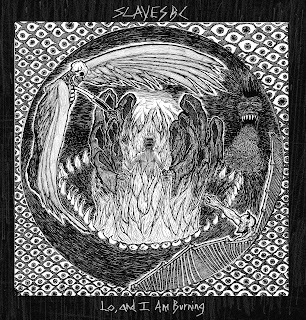 Moving onto Slaves BC then and their latest full-length "Lo, and I Am Burning". It is being released tomorrow on vinyl and also on digital platforms, via the band and The Fear And The Void Recordings. This full-length follows their 2016 debut album "All Is Dust and I Am Nothing". Their blackened doom has recently got them attention over at Noisey and their hometown album release gig in April is due to include the awesome Imperial Triumphant. Slaves BC packs a mighty punch on “Lo, and I Am Burning”. Opener Lo is a bleak and slow black metal song with screeching vox that is interspersed with blasts and reeking dissonance. The riffs at the start and end are pure sludge. There’s an obvious feeling on continuation between the album’s opener and We Are All God’s Fault, which carries on in the same tempo. It builds on their metallic sound, all the while adding layer upon layer of atmosphere. The stop-start nature of the song-writing and the eschewing of pauses between tracks makes it flow in a way that might surprise but that also pleases. There’s no moment for breath as the grinding fury of Lightbearer takes hold. Maddening time-signatures and icy black metal only make that fury more real. Glory is an utterly ambivalent sub one-minute song that leads nicely into XLV, where Slaves BC once again show off their appreciation of sludge and doom. It’s a lot more experimental and they don’t just stick to one sub-genre, as with the rest of the record. Basically, they just play what they want as long as it’s in the heavier realm and are all the better for it. You can’t really get more foreboding than I Looked Upon The Face Of God And My Body Turned As Ash (for a song-title anyway) but the music held herein lives up to that adjective and more besides. More fast, grinding, metallic black metal with no rest. The lengthier songs on the album really do highlight an engaging side to Slaves’ music. Honor Thy Father And Mother is only one of two songs that passes the five-minute mark but it’s full of discordance and as harrowing as you could imagine. When Her Prayers Are Silenced starts off sounding like some dystopian power-electronics song with distant screams before turning back down a more familiar path (obviously the comparison to power-electronics is my own and probably not accurate). Closing song Unclean is super apt, as you’ll no doubt feel dirty by the time you reach the end of the album. It would be hard to cleanse yourself of the contents of “Lo…” but then again if you have got this far then you’re probably not bothered. Slaves BC have written a monolithic slab of noisy, heavy black/doom madness that pretty much spells out this world’s implosion. Try to change my mind. Grave Spirit - The Beast Unburdened By Flesh 7"